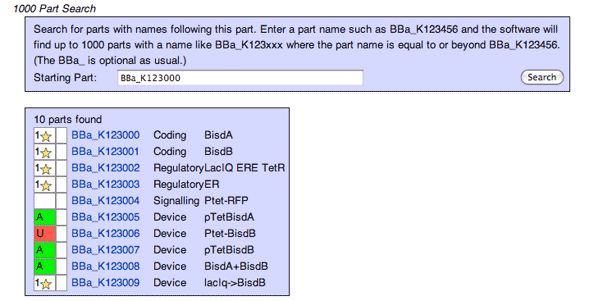 Know the part name (ex: BBa_E0040)? Type it into the search field on the Registry menu above, and go directly to the part's main page. Hover over the gray triangle next to the search field for the full search drop down menu, which has multiple search options. The Registry has several search tools which let you find parts in different ways. The search will first breakdown the composite part into basic parts. Basic/composite parts matching portions of the composite part will be returned, along with a key showing the status/availability of the parts. This search will also show twins for your part. You can enter multiple parts, but they need to be in the correct order. if you're putting together a new composite part. You've added the part to the Registry and are going to assemble it in the lab. 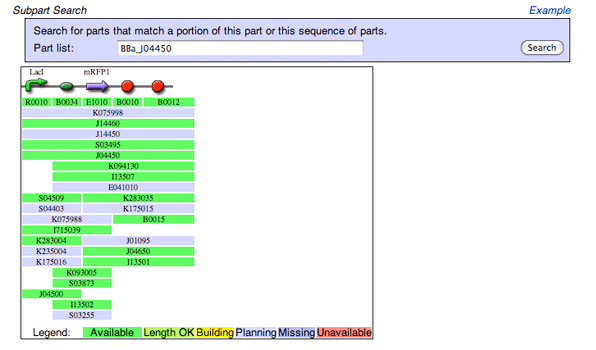 Instead of assembling the entire part from basic parts, you can see if the Registry has intermediates. This will save you time in the lab. You could assemble BBa_J04450 from its five basic parts, or you could assemble BBa_R0010 (basic part) with BBa_I13507 (composite part). Parts with available samples will appear at the top of the search results. if you've found that a sample of your part is not available or has poor quality control. 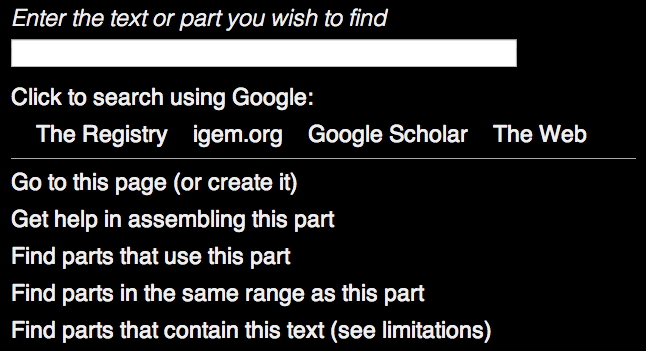 This search can be used for identifying all parts that an iGEM team or lab have added. Each iGEM team or lab group is given a range of part names (Ex. BBa_K123000 - BBa_K123999) to use when they've registered. By entering BBa_K123000, the search will return results for all parts between BBa_K123000 - BBa_K123999. Search for a word or phrase. This text search will look through the short description (S:), description (D:), notes (N:), and author (A:) of parts to return your results. 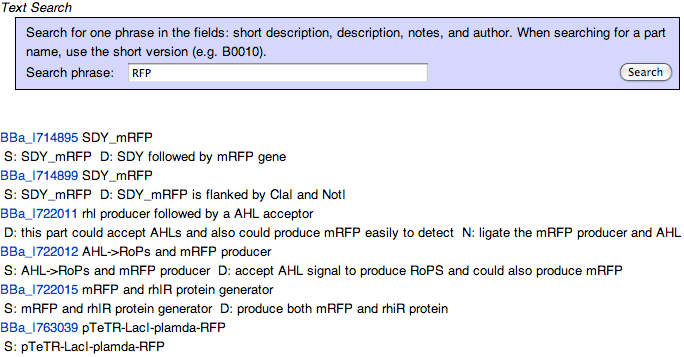 You may want to try a few variants of the description of the part, e.g., RFP; red fluorescent protein, etc. This search is nonspecific: you may be returned results including basic parts, intermediate parts, devices, etc. You may find that some results only have references to your part, instead of including the part itself. 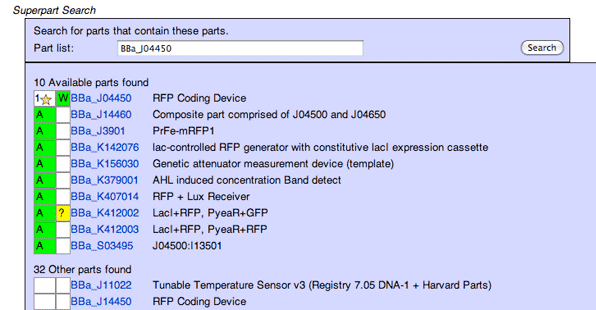 You can browse the Catalog of Parts & Devices or do a Text Search. The Catalog organizes the available parts of the Registry by various criteria and a Text Search will let you search using a descriptor. If you know the part name (e.g., BBa_J04450), simply type the name (BBa_J04450, or J04450) into the search box at the top right corner of the Registry and hit enter (or click Go). This immediately takes you to the Main Page for the part. You'll want to do a Superpart Search which will list all the composite parts containing your part of interest. The parts that are available from the Registry will appear at the top of the search results. You can enter multiple parts, but they need to be in the correct order. You may find yourself putting together a composite part made of several basic parts. Before you begin assembling your part in the lab you'll want to use the Subpart Search which will show you whether there are any parts in the Registry that match a portion of your composite part.